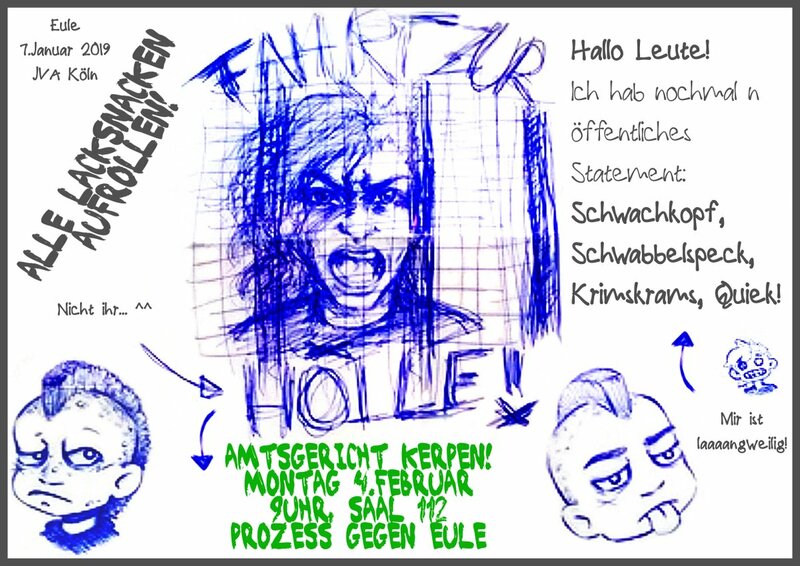 On Monday the 4th of February the trial against Hambacher Forrest defender Eule (Owl) takes place in Kerpen. Eule was arrested during the eviction of Hambacher Forrest last year and is in pre-trial custody for more than 4 months now. Published by ABC Rhineland. Translated by Enough is Enough. After more than four months in pre-trial custody, the trial against Eule takes place on Monday, February 4. Charges are assault on enforcement officers according to §114 clause 1 StGB (penal code) and attempted assault according to § 224 clause 1 numeral 2, 22, 23, 52 StGB. Eule is pleased about solidary process company! Monday, February 4, 2019, 9.00 a.m.